We’re often asked at the cellar door how Mornington Peninsula wines and those produced by Montalto are characterised. We decided to tackle this question head-on and go straight to the horses’ mouth for an answer: our winemaker, Simon Black. Simon, can you start by telling us about your winemaking philosophy? My goal at Montalto is to create wines of exemplary quality and character by utilising winemaking techniques that complement the unique qualities derived from our vineyards, in a style that I think best reflects each vineyard site. I want to create wines with purity, focus and complexity. Above all, the wines need to show flawless balance – a harmony between all elements. Do you have a customer ‘type’ in mind when creating wines? When making wine, I’m always thinking about how it will match with food. To me, a wine with verve, freshness and a bright line of acidity is the perfect accompaniment to food. What’s the difference between the ranges in the Montalto family? To use an analogy, the Single Vineyard wines are like the principal soloists in an orchestra; each is unique in their offering. Years of innovative trial work in the winery has given us the knowledge required to capture the hallmark qualities and personality from these sites. The Estate wines are more like the orchestra, where all the musicians come together to create a multilayered symphony. These wines are crafted from our best parcels of fruit from our vineyards across the Peninsula. The Pennon Hill wines are all about drinkability. They showcase all the qualities that the Mornington Peninsula is best known for – perfume, purity, varietal expression and brightness. How would you describe a Montalto chardonnay? When it comes to chardonnay, we always have a beautiful core of citrus and white-fleshed stone fruit. Through a range of vinification techniques, we build complexity and mouth-feel around the fruit. 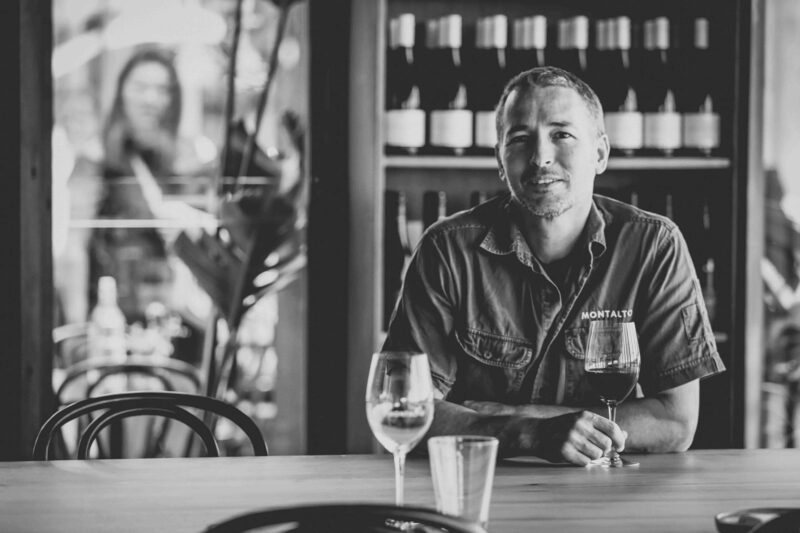 What’s the secret to making great pinot noir at Montalto? Pinot noir is a fickle critter with many different expressions of the variety available due to the dynamic nature of the Peninsula; site selection, clonal variation and winemaking all contribute to the diversity of style. The key with pinot is to nail the picking date locking in the varietal definition. Various winemaking techniques allow us to add complexity and to shape the framework – the winemaking magic – and that’s how we aim to create world-class pinot.